Autobiographical stories from one of Japan's masters of modernist story-telling. This is an interesting addition to the Little Black Classics range, as two of the works in the book are memoirs, alongside one short story. As is usually the case with me and fiction, I much preferred the short story to its autobiographical siblings. In a Bamboo Grove describes the events of a murder through the eyes of many people; the woodcutter who discovered the body, the policeman involved in the investigation, the accused, the wife of the murderer, and most interesting, the deceased himself speaking through a medium. Each of their accounts were written gorgeously, and I particularly enjoyed their descriptions of the beautiful surroundings. Most importantly, we aren’t able to reach a conclusion on how the events unfolded due to everyone’s tales being so markedly different. It was thought provoking, lyrical, and maddening. I loved it. We then go on to the stores of the author’s life themselves. Death Register spoke of his sorrow and grief as he described the deaths of family members. 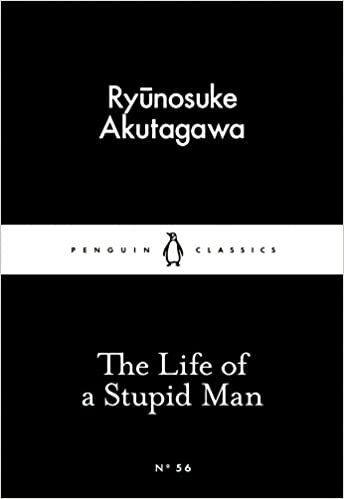 It wasn’t as heart-rending as it should be, but I think this speaks of his numb persona, which we go on to explore in The Life of a Stupid Man. Comprised of small vignettes of his life, the titular story flashes through the author’s life quickly, but confusingly, showing us a scene or conversation he remembers, before moving on to the next one quite rapidly. We see his descent into depression, hear his thoughts on existentialism, yet nothing really settles into the heart here. I enjoyed the format, with each of the memories having a title, but I can’t admit to enjoying the memories themselves. I was completely baffled as to how to begin to interpret them, and had to write them off as some kind of subtle poetry. I’m very grateful to have experienced In a Bamboo Grove, and it’s something I’d like to read over again, however the other two creations will now be lost within the dark area of my brain titled ‘Little Inconsequential Things I Once Read.